Or, for the less gentle crowd, kitchen crack. 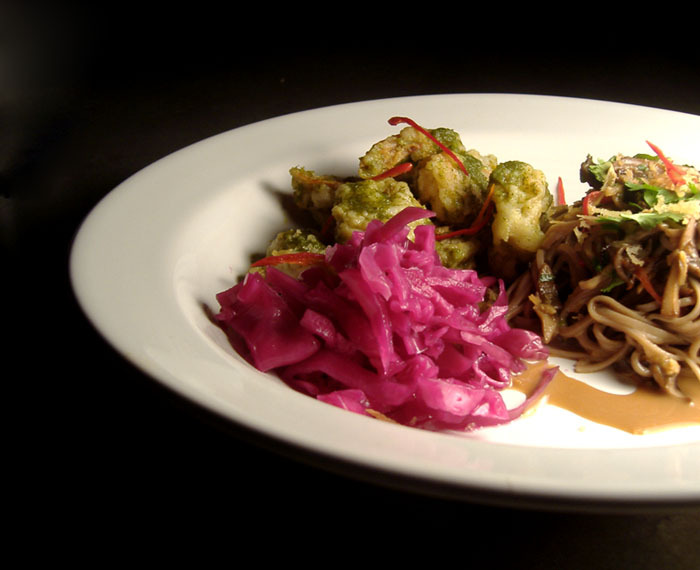 Flavorful, addictive little things that put your food over the top. 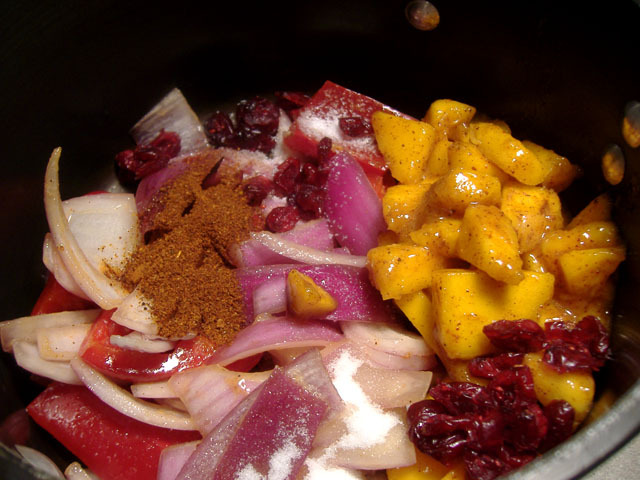 Each culture has its stock of these kind of ingredients that are used as flavorful garnishes. But they're more than garnishes; more like flourishes. In fact, if you are really going to learn another cuisine, a useful first step is to take a little time and make some of these kinds of basic preparations, and more importantly, have them around ready to use, which is the important part. The meez. 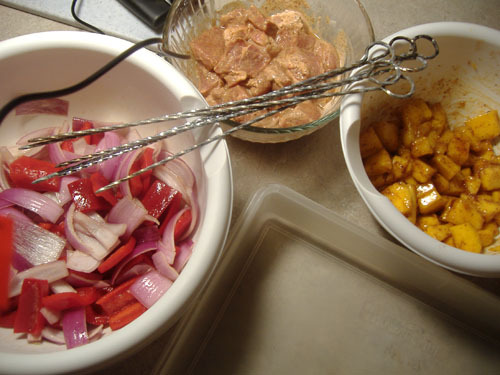 I don't think of the meez as just a convenient arrangement of things while I'm cooking, but rather as something that extends to the whole kitchen, and includes all those things that I have on hand, things I can produce and use quickly. That is, things I can put right into the meez with very little effort on my part and get a big return. Fried Thai things. 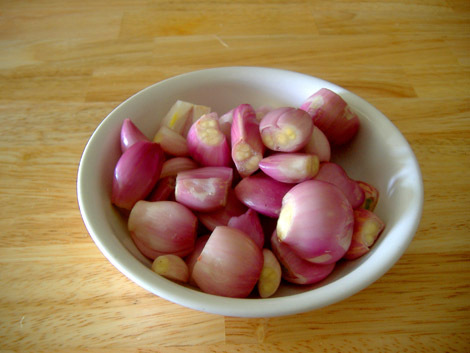 In particular with SE Asian cuisine, fried things like shallots, ginger, and nuts come up over and over again. If you have to make these things every time you need them, a simple Thai relish or curry becomes a protracted but infrequent affair. But if you invest less than an hour and make enough to store, then you're much closer to a the Thai swoon at any given time. 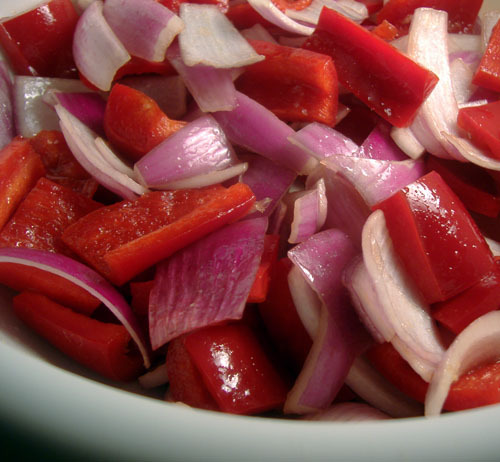 Shallots. The hardest thing I had to do was peel the shallots. 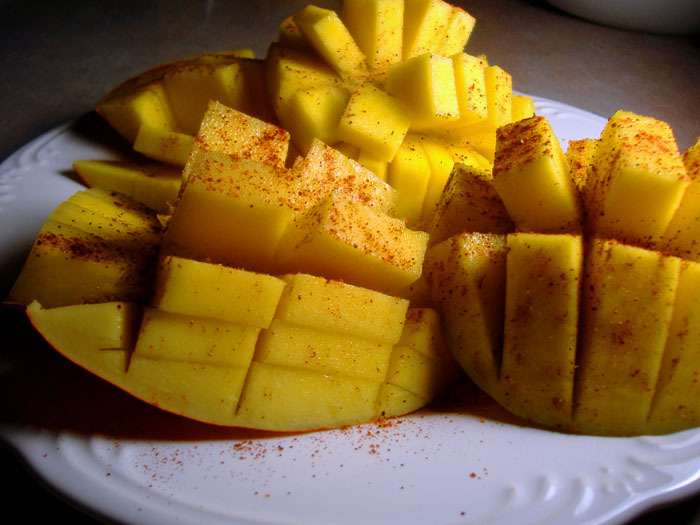 To peel them quickly, I slice off both ends, slice them in half lengthwise (i.e. end to end) , and peel off the whole outer layer. You sometimes sacrifice a little of the flesh, but it goes much easier. Once they were cleaned I just pushed them through the thin slicing disk on the food processor and put them into hot oil, which I heated until it was shimmering and swirling a little bit. Ginger. Next up was ginger. If you have a nice sharp paring knife, then the ginger peel comes right off. You need to hold the pieces in some water with a little lemon or lime juice to keep it from turning blue. Once the pieces were peeled, I used the fine shredding disk on the food processor and then into the oil they went. Almonds. 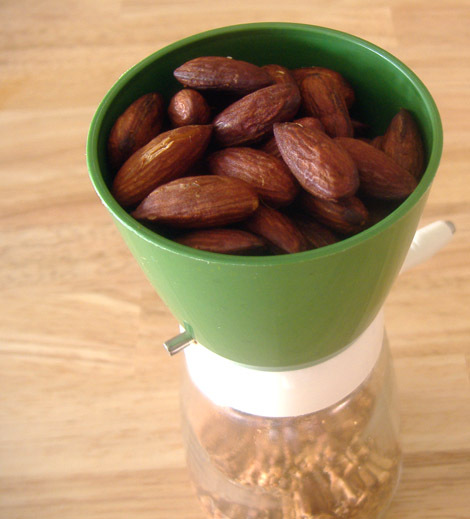 I finished with fried almonds. Nuts can just as easily be roasted in a 300 degree oven or even in a dry pan, but I find that the heat transfer is much more consistent in hot oil, and they take on a light gingery shallot flavor from the oil. No prep work needed; I just put in as many almonds as would fit on the surface of the oil. Once they darken a little, I fish one out and break it open. I'm looking for a light amber color all the way through. I chopped half and kept half whole. These things are rich, but they go a long way because their flavor is deeper and more concentrated. I think there is a fine middle ground in cuisine where techniques typically associated with one culture can be profitably combined with ingredient and flavor profiles from another culture, and still make sense. 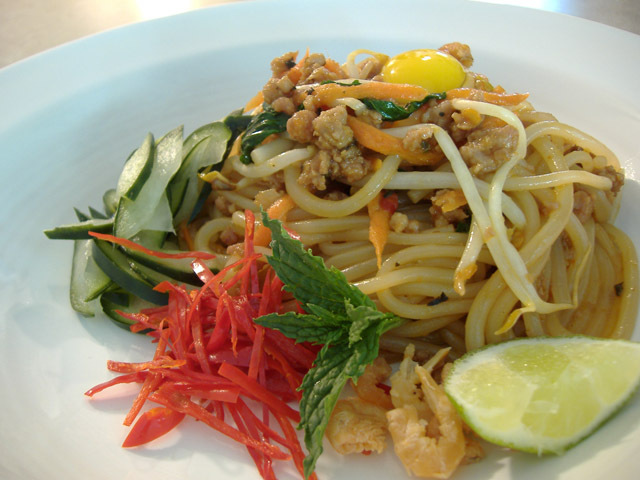 In this case, it is not exactly a stretch, as frying is certainly known in Thai cuisine, and elevated to a Platonic ideal in Japanese cuisine. Tempura 101. Tempura is a very light, delicate, crispy batter-fried thing. The batter is typically equal parts powders and liquid, with the powders being mostly flour and sometimes cornstarch, baking powder, salt, or sugar. The liquid is typically cold water, but may include club soda or beer, and an egg may be mixed in. The egg may be whole or just the white or the yolk, and whipped until light or not. 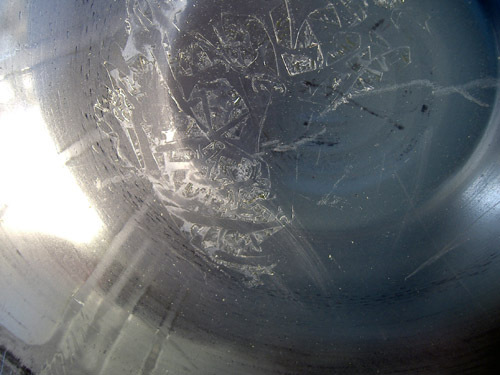 The liquids are mixed well together and the solids are mixed well together, but the liquids and solids together are expected to be lumpy and undermixed. The idea is to not overwork it, and to not create a batter that is going to form a strong barrier. Usually with tempura, the food being fried is still very much visible, unlike, say, fried chicken. The magic of frying. 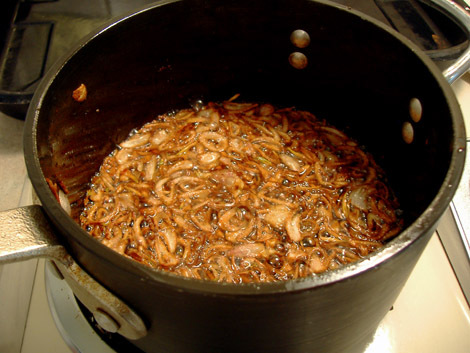 Any frying done correctly does not impart much oil to the food, but rather draws out a lot of moisture via steam, which leaves the food very flavorful. The steam exiting from the food keeps the oil out. Some oil will collect on the surface, and a little will be absorbed by the batter. Pickles. I made some quick pickles the night before to have at the table for noshing before and between tempura waves. 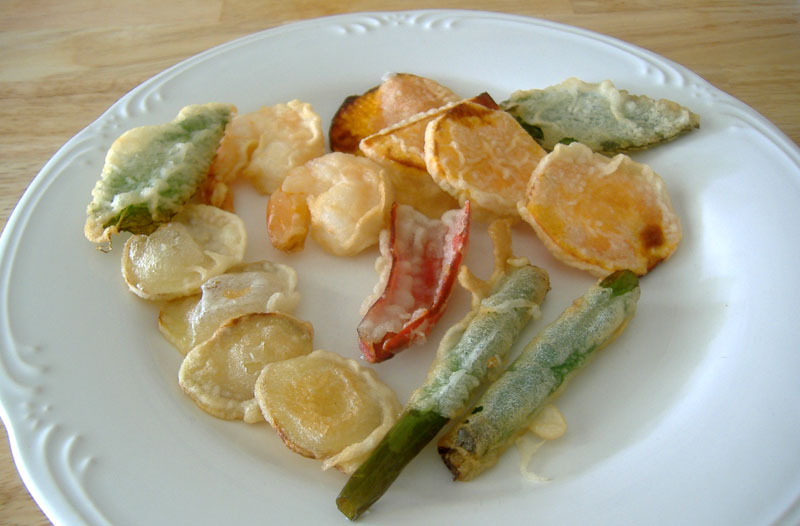 Pickles nicely complement fried foods. The carrots were steamed slightly and pickled in OJ and cider vinegar with ginger. I’ve had the red cabbage around for awhile now. It is in a plain vinegar-sugar-salt solution with a hint of clove and allspice The cucumbers were salted and put in ice water overnight. I dressed them right before serving with a little soy and sesame oil. They were light and crisp with a slight nutty flavor from the sesame oil. The bok choy was the heavyweight: Chinese black vinegar and chile garlic paste. By far my favorite, and despised by everyone else. Condiments. 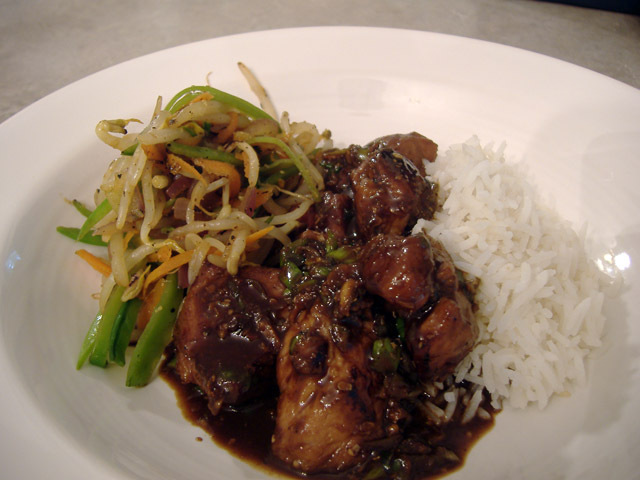 I put sort of a Thai twist on this by serving it with an FLS sauce with chiles. 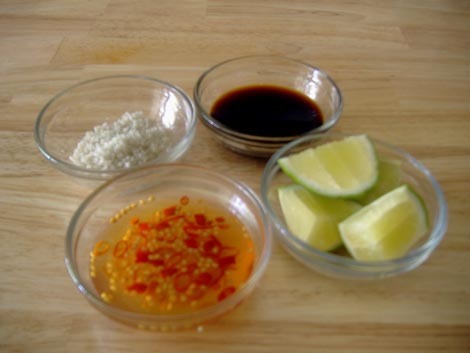 I also put out a soy dipping sauce too as well as some sea salt for an extra blast. The stuff. This was the first round. 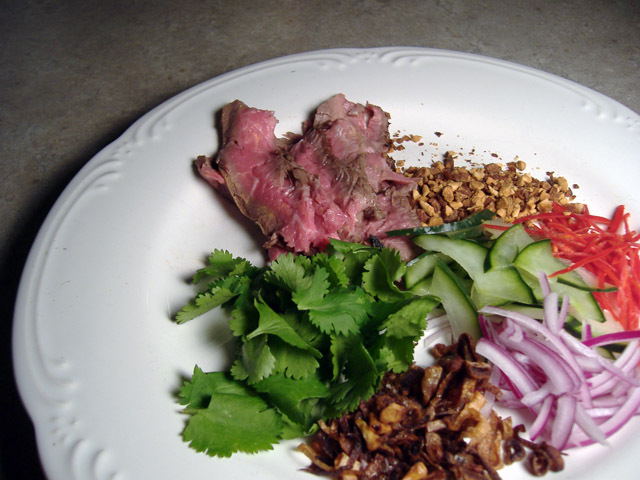 In keeping with the Thai theme, I included some mint leaves, red chiles, scallion, and thinly-sliced ginger. The ginger and mint take on a lighter flavor with frying, but are still explosive. Also, some shrimp and sweet potato, both of which are fairly standard. The fun part is making little combinations as you eat it; shrimp, ginger, mint, and chile was my favorite. More pastes to experiment with: These turned out to be great, although I was a little distressed to see that one of them is called “Shito.” They all have a shrimp flavor. Once you go down the dark road of fish sauce, this stuff starts to taste really good, just like that dried shrimp. 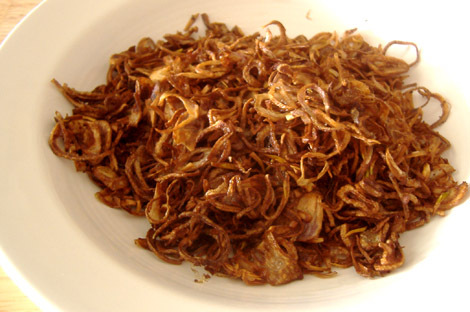 Dried shrimp: Pretty good ones from the refrigerator. 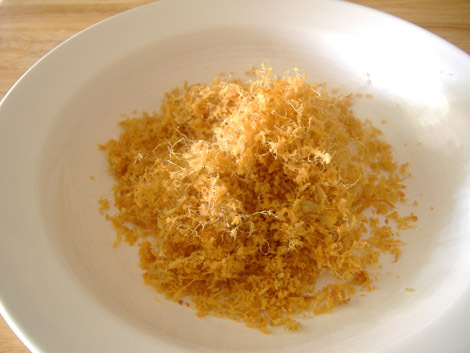 Palm sugar: I never use this stuff, because sugar is basically sugar. But, I thought I would try some just to make sure. Dried ivy: another experiment; a nice tangy dried fruit candy. Ladyfinger-type cookies: This was an experiment. Made from mung beans. My son looked at the cover and asked if they were made from peas. They have almost a cheesecake-like filling. 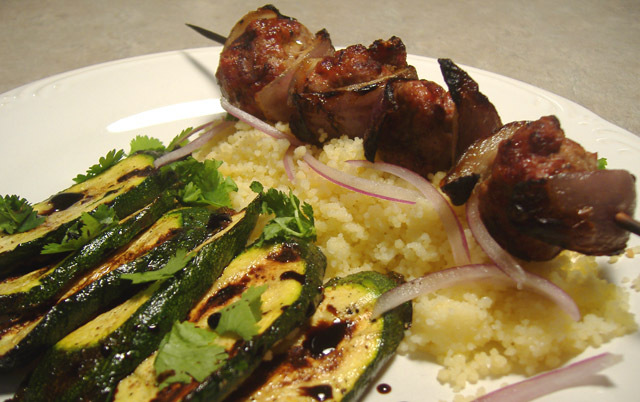 Quail eggs: a fun thing to try. 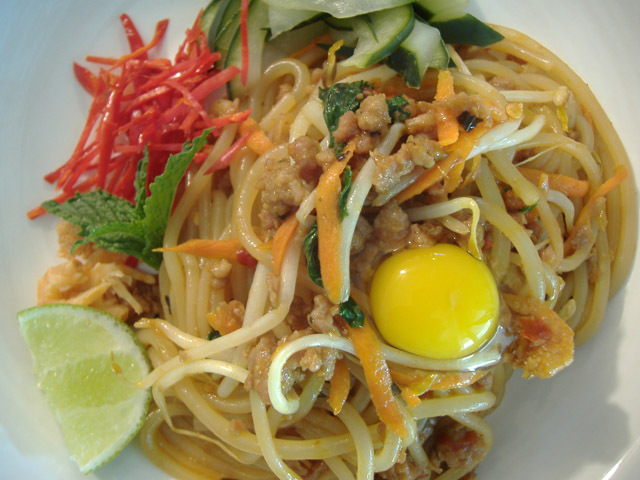 Nice small yolks for dropping raw on top of warm noodles. 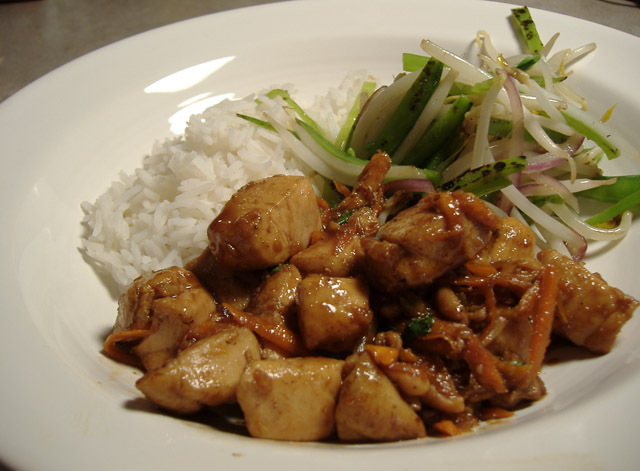 Galangal, ginger: the basis for most pastes. 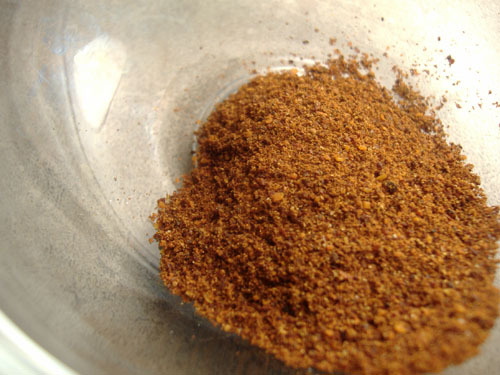 Sichuan pepper: a must-have for good stir fries, and most anything else that can take black pepper. 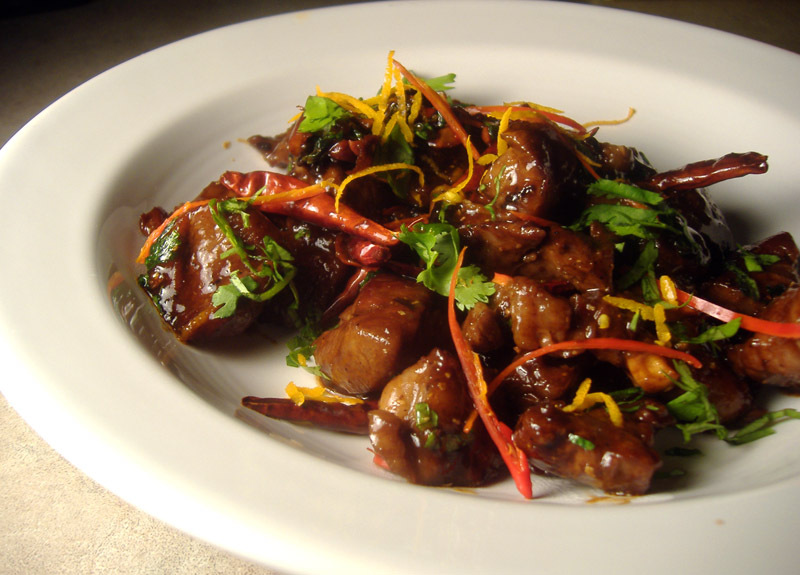 Kecap manis: a sweeter soy sauce, usually found in Indonesian cooking. Basil: of course. I’m so glad I don’t have to grow this stuff anymore. The stuff from our garden was just OK, but this is mind-expanding. This was a great late-night salad I was able to put together really quickly with some leftovers that were sitting around. I put that fried shrimp with a green chutney, made up some udon noodles and sauteed mushrooms with a sesame-soy dressing. Served with some pickled red cabbage, garnished as always with herbs and chiles. 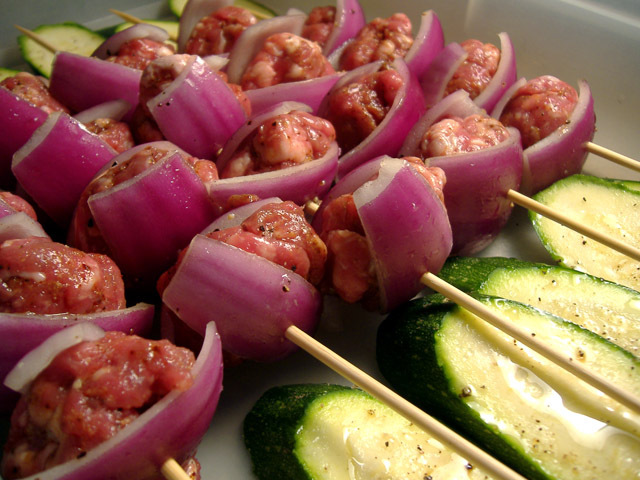 This is another good example of the kinds of cooking you can do once you have some stuff laying around. 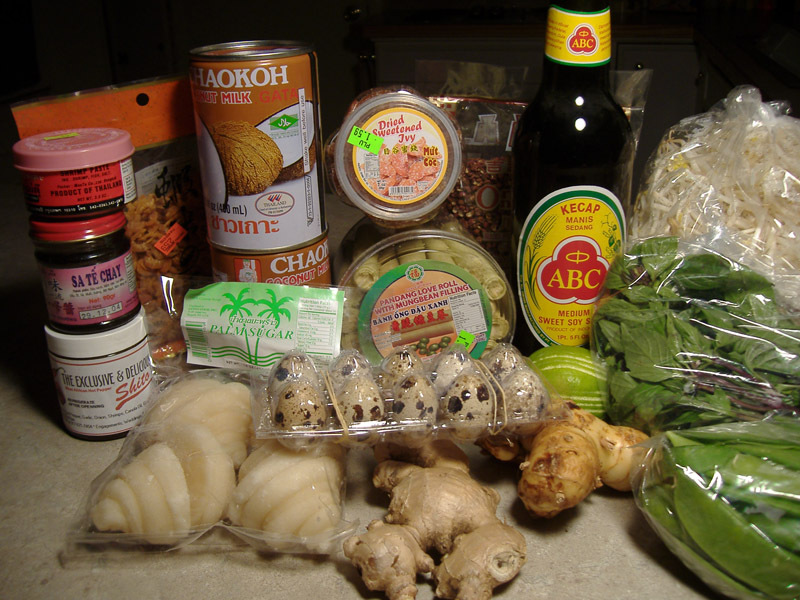 I still maintain that the hardest part about Thai cooking is having the stuff around; once you have a few basic ingredients, they come up over and over. Potato: American potato salad, German potato salad, or fries. Often a macaroni salad too. I think of it as the Chicken Wing of the Sea: just another big fried thing well loved by the natives. 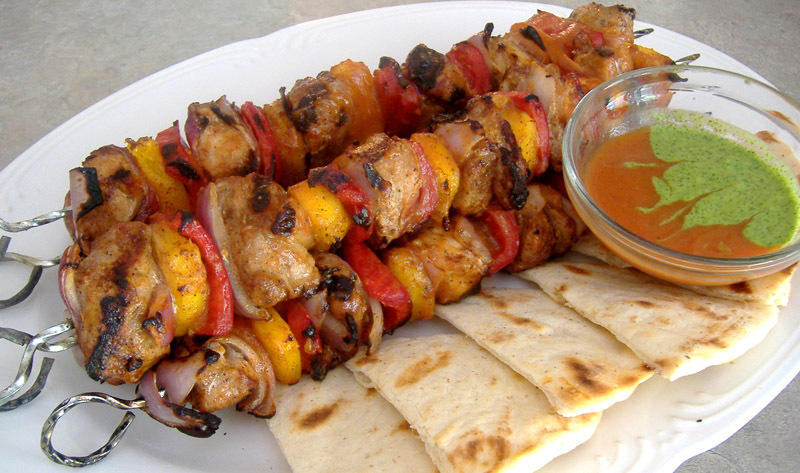 The meal itself is not so bad, it's just rarely executed very well. I got to thinking about using it as the inspiration for some Thai-flavored fried fish. Shrimp in tempura batter with BMC, chile, deep-fried ginger, crispy pork belly, and an FLS dipping sauce. Potato curry: paste from before, coconut milk, and the potato-thing that I thought would be orange. 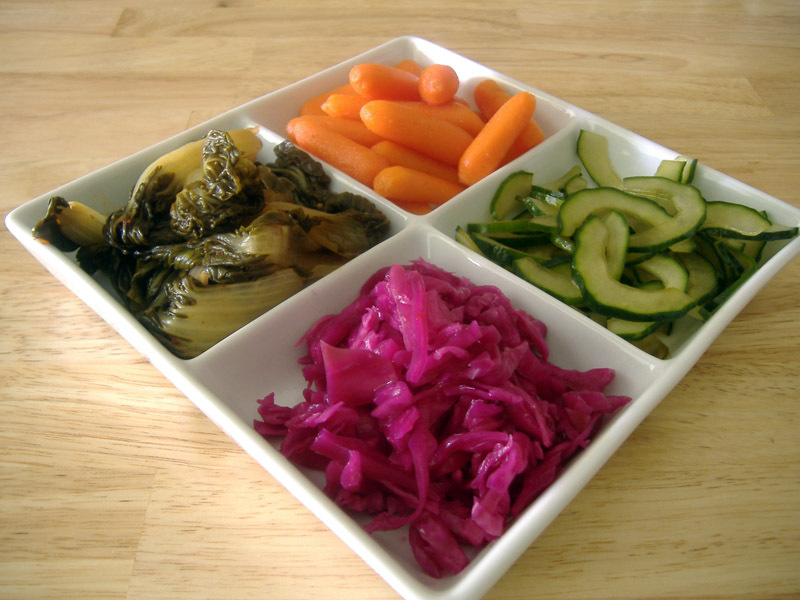 Pickled red cabbage and fresh grated carrot. I’m not much of a booze drinker, but I came across this really great introduction to classic cocktails on eGullet and was impressed by its organization. The author does not divide the drinks by base spirit, which is the usual way, but rather by flavor profile, an approach that I think makes a lot of sense. Profiles are the different combinations of sweet, sour, bitter, herbal, etc. The article had this recipe for an Aviation: gin, lemon, and maraschino, a not-so-sweet Italian liqueur made from cherries and their pits. I do like gin, and I like sweet and sour things, especially those involving citrus, and I’m a big fan of all things cherry, so what is not to like? 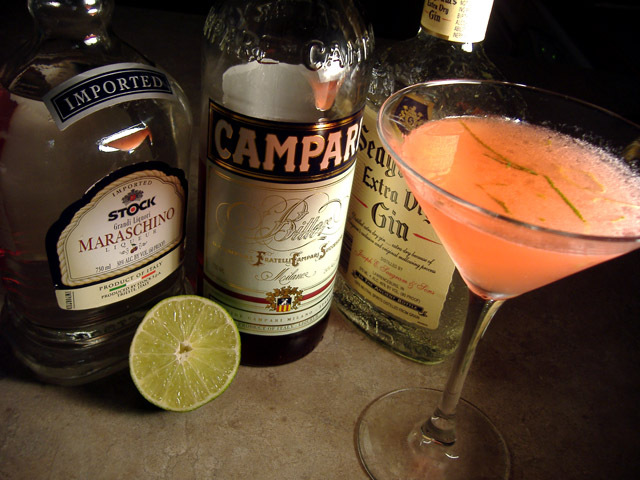 I also like a little bitter on the scene, which I thought I’d add with some Campari, another Italian liqueur with a unique flavor based on herbs. The typical ratio for the aviation seems to be 2 parts gin to 1 part lemon juice and 1 part maraschino, with some recipes calling for more gin. I had an unremarkable gin, so kept it at 2-1-1, but substituted lime juice and added 1 part Campari. If I were using a better gin, I’d probably use a greater proportion of it. The result? Great. I call my variation the Levitation. One problem: it’s pink. Does Campari trump pink? I think so. 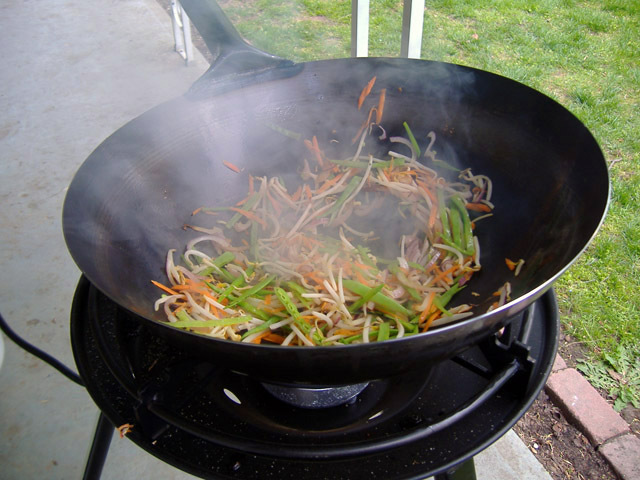 I’ve been thinking about a turkey fryer for some time, mostly to use as a great big wok burner for some really righteous stir fries. 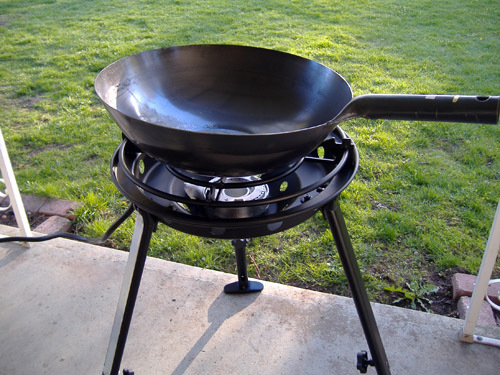 I went with this one (listed at the right) because it is made specifically to hold woks (most turkey fryers are flatter on top) and it adjusts up to a normal cooking height. Just as important as getting a lot of heat, it is nice to sear and fry and be able to keep the heat and smoke and oily smell outside. 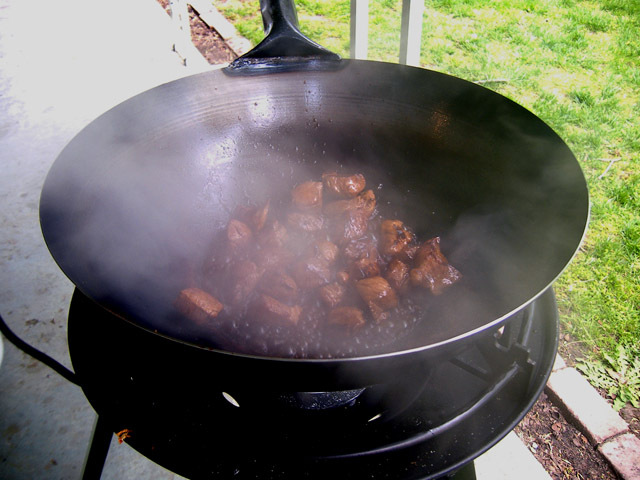 I don’t really think there’s much I can do with a wok burner that I can’t do with a cast iron dutch oven on my little electric burner top, except on a grander scale. 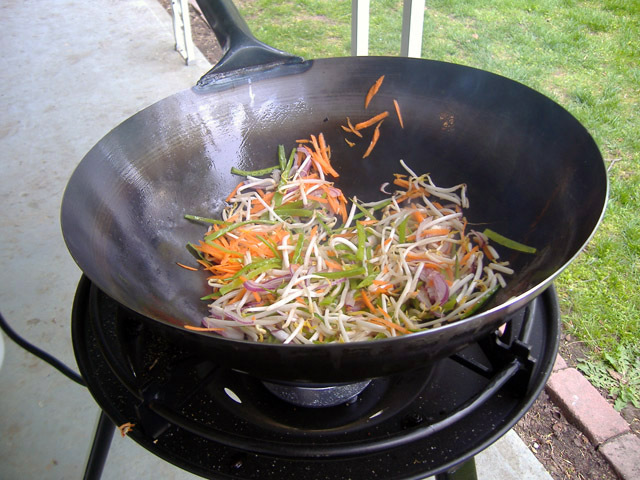 And being able to use a round bottom wok is kind of fun. 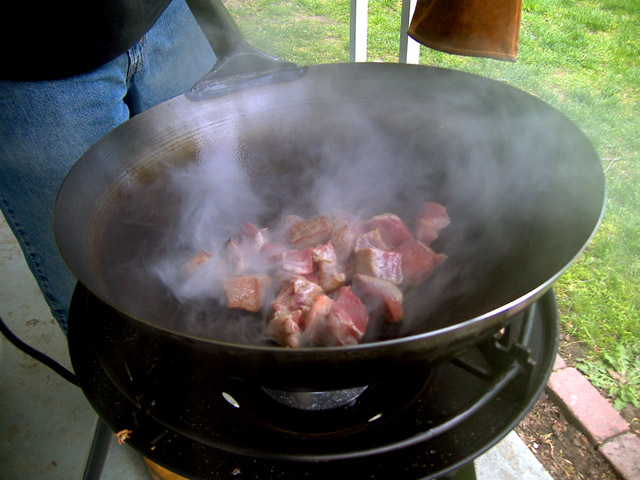 Seasoning the wok. The before shot is on the left; it comes coated with some sort of crap to keep it from rusting. 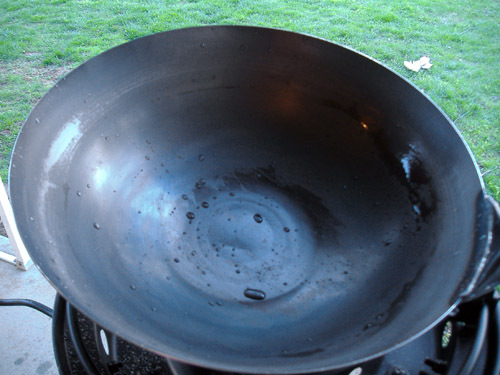 The first night I cranked it up and seasoned it using two methods: wiping the hot wok with oil and wiping it with salt. I have to say, the salt method is really intriguing in that I have no idea how it works. As the oil burns, it forms very hard compounds and thus makes a nonstick surface. But the salt? I have no idea; must be a similar process. As I was wiping it around with a wad of paper towel on the end of a very long set of tongs, I could literally feel the surface of the wok becoming smoother. Notice the water beading up in the after shot. Blow ups. I was a little timid in starting it, after studying up on all the possible ways I could self-immolate through carelessness or misfortune, and it didn’t help that my neighbor was firing off a mortar right as I was lighting it. No, that’s not a joke: he was practicing for a civil war weekend in a field across the street. So I had a couple of bad jolts but managed to get the thing going. This thing really does get hot, way hotter than you actually need; in other words, just right. May be the best 50 bucks I ever spent. First stir fries. For the first one, I went with something basic to get used to the thing: some chicken with a spicy sauce along with dry-fried bean sprouts, pea pods, and red onions, all dressed with a little sesame oil, Sichuan pepper, and black vinegar. The sauce was some hoisin, soy, chicken stock, sweet soy (i.e. kecap manis), oyster sauce, and a little corn starch. The next one was basically the same thing but with pork shoulder. This is probably something like a dry curry. 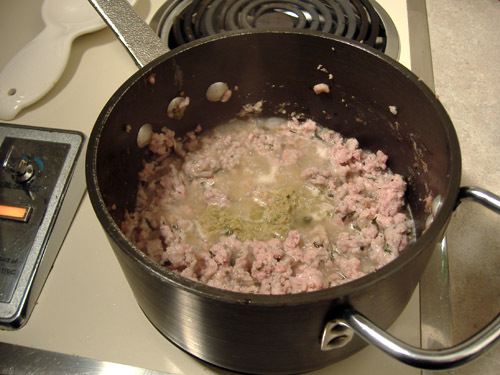 A few years ago I was making spring rolls and got the idea to simmer the ground pork like a bolognese. 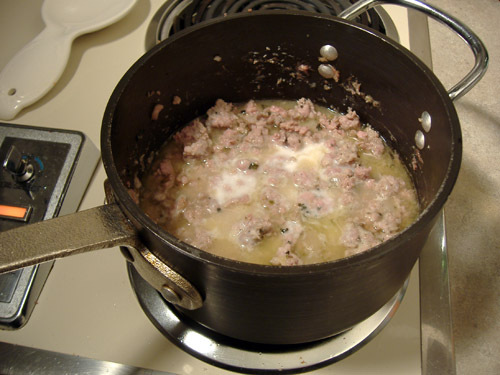 If you don’t know what that is, it is an Italian meat sauce in which beef and pork are simmered with white wine, milk, and tomatoes for a long time until the meat is soft and luscious. 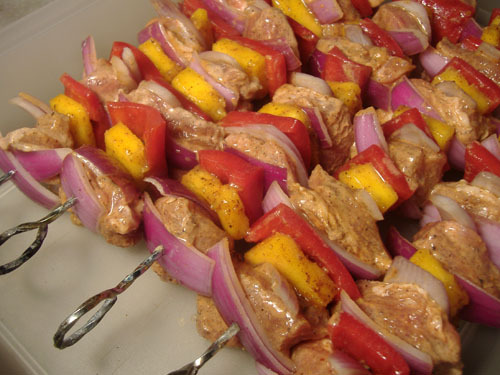 I was wondering how to add more flavor to the pork and thought about doing the same thing except with coconut milk and a little curry paste. 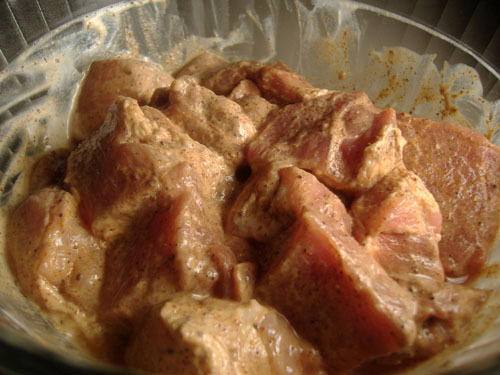 I think it really works; the pork becomes scented with the flavors of the curry paste and impregnated with coconut milk. 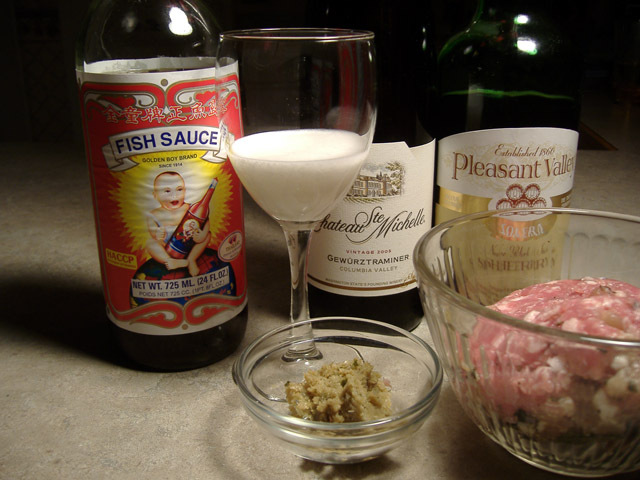 I start by mixing some fish sauce into the pork and letting it sit overnight to season it up. When it’s time to cook it I start by frying the paste with the meat (although if you look closely you’ll see that I got ahead of myself this time), and then add enough wine to simmer the meat. I use both gewurztraminer and sherry, the former for acidic and spicy fruitiness and the latter for more of a dark sweetness to complement the coconut milk. (By the way, that Chateau. Michelle is my “go to” gewurtz for Thai; good strong fruit, acidity that almost makes it seem like it’s sparkling, and a little sweetness to stand up to the heat; amazingly, under $10.) Then I start adding coconut milk about a quarter to a half cup at a time and reducing until almost dry. This is really a matter of how flavorful and rich you want it. I tend to make it both and then counter it later with some fresh and vinegary things. And, a little goes a long long way. I made this dish with some tapioca noodles mixed with dried shrimp and mint and finished it with a raw quail egg on top, to completely gild the lily and make it like a carbonara. 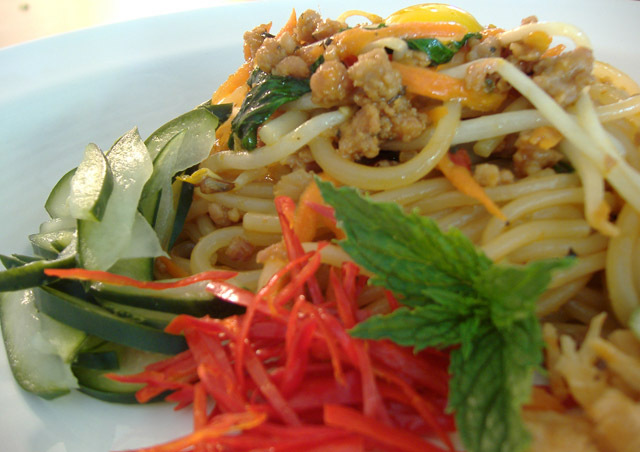 The pickled cucumbers and fresh sprouts and carrots help cut the richness a little. 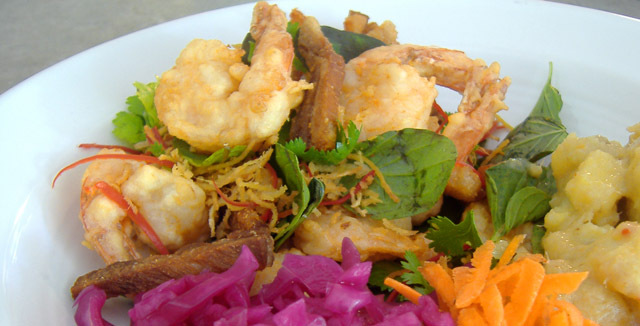 Thai salads are made largely of the same things we already have, but with mostly fresh ingredients. I had some leftover flank steak and wanted to make a salad out of it, so I made a quick FLS sauce that was a little less on the sweet side and let the beef sit in it along with some red onion and thinly sliced cucumber for about 20 minutes to pick up the flavor. 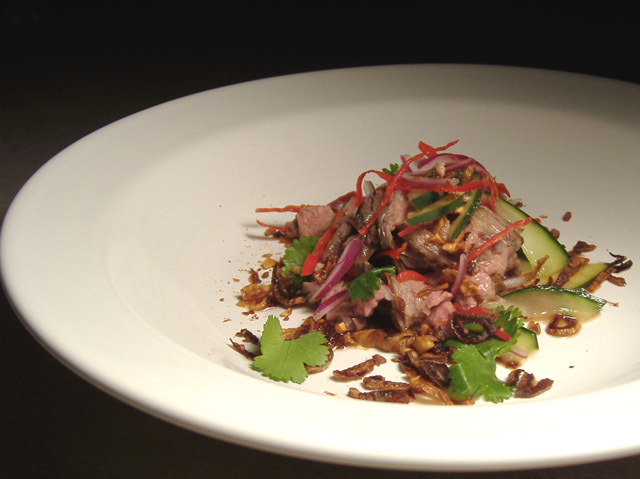 The fish sauce brings out a very rich beefy flavor that is noticeable even with cold beef. I finished by mixing in some chile and cilantro and garnishing with almonds and fried shallots. I also had some mint that I forgot to add until I started eating it. All sorts of flavors going on in this little salad.